SACRAMENTO, Calif. (AP) — Consumer activist Erin Brockovich, who famously took on Pacific Gas & Electric Co. in the 1990s, urged California lawmakers Tuesday not to let the utility go bankrupt because it could mean less money for wildfire victims. 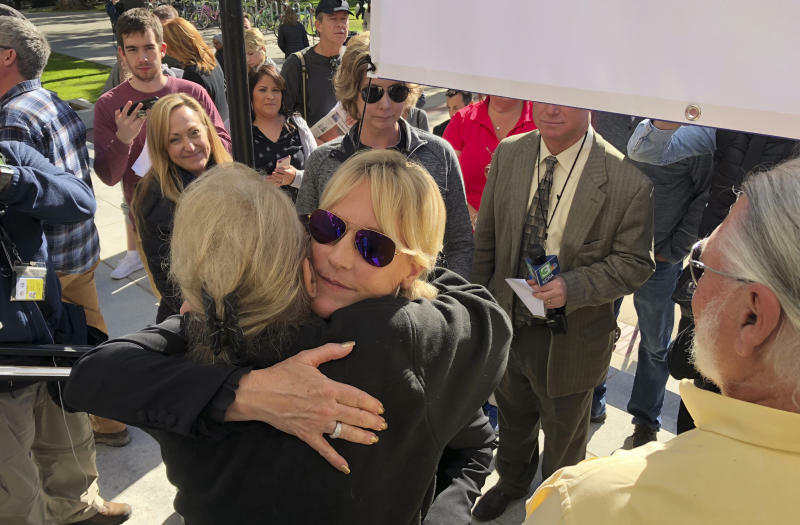 "I'm mad, I think we should all be mad," Brockovich said as she stood outside the Capitol in Sacramento alongside people who lost their homes to destructive fires. PG&E announced last week it plans to file for Chapter 11 bankruptcy because it can't afford to pay at least $30 billion in expected damages due to deadly 2017 and 2018 Northern California wildfires. California law makes utilities entirely liable for damage caused by wildfires sparked by their equipment, even if the utility isn't found to be negligent. The cause of a 2017 fire that swept through Santa Rosa and the 2018 fire that destroyed Paradise are still under investigation. PG&E is under scrutiny in both cases, and lawsuits have been filed by people who lost their homes and are underinsured or lack insurance. Brockovich is part of the legal team representing victims of the 2017 fires. Under a PG&E bankruptcy, wildfire victims likely won't get all of the money they have sued for, experts have said. 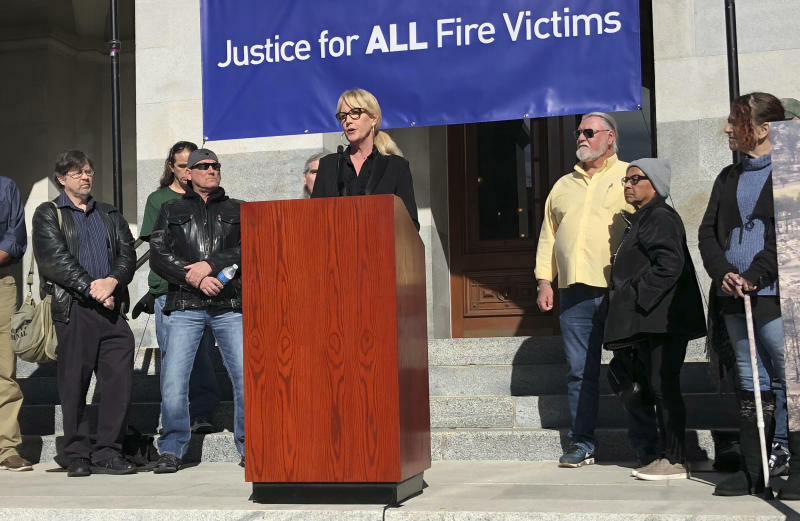 Brockovich and Noreen Evans, a former state lawmaker representing wildfire victims, suggested the Legislature should allow PG&E to take out state-backed bonds to cover the costs of the 2018 fire and potentially pass some costs to ratepayers to avoid bankruptcy. Lawmakers allowed the utility to pay for 2017 wildfires in a similar manner but did not apply the same standard to 2018 fires, something the lawyers called a serious oversight. Critics, including Evans, have called the law a "bailout" for the utility in the past. Now, she said, 2018 wildfire victims deserve to be treated the same way as 2017 wildfire victims. "It's not a bailout, although I've referred to it as a bailout in the past," she said. State Sen. Bill Dodd of Napa, who authored last year's wildfire bill, has said 2018 was not included because lawmakers didn't want to discourage PG&E from focusing on its safety if it thought it would have a guaranteed way to pay for wildfire damage. Beyond the short term, Brockovich urged state lawmakers to adopt stricter oversight of PG&E, a utility that she said has a well-documented history of negligent or dangerous behavior that the state has let continue for too long. "Be at the head of the table and take control of this runaway monopoly," she said. PG&E is "committed to working cooperatively with regulators, policymakers, and other stakeholders to continue to provide PG&E customers the safe gas and electric services they expect and need," utility spokeswoman Lynsey Paulo said. The company's board has decided bankruptcy under Chapter 11 is "the only viable option," she said. Brockovich rose to fame while fighting PG&E in the 1990s over a toxic chemical in the water supply of a Southern California community. Her fight became the subject of a movie starring Julia Roberts. Currently U.S. Judge William Alsup is overseeing a jury verdict against PG&E stemming from a deadly 2010 gas pipeline explosion, and he is considering whether the company's role in recent wildfires was a violation of its probation in the criminal case. Alsup has noted that California fire investigators referred 12 wildfires caused by PG&E equipment for possible criminal prosecution. He has proposed imposing new probation terms on the utility, including that it remove or trim all trees that could fall onto its power lines, poles or equipment in high-wind conditions and re-inspect its entire electric grid. The judge gave PG&E until Wednesday to respond to his proposal. Brockovich said regulators should consider forcing the company to bury or cover its lines. The utility said Tuesday in a regulatory filing it has lined up $5.5 billion in credit and loans to continue operating as it prepares for the bankruptcy. Gov. Gavin Newsom said last week it's his goal to prevent the bankruptcy from going through but it may not be possible. Evans said there have been "very preliminary discussions" about settling claims related to the 2017 fires at a judge's request. This story has been clarified by removing comments from Noreen Evans that a PG&E bankruptcy could threaten power service, which she says she was not implying.